Manufactured by Walberg and Auge of Worcester, Mass., the “Perfection” brand of percussion instruments was widely sold to “jobbing” drummers both prior to and after World War I. 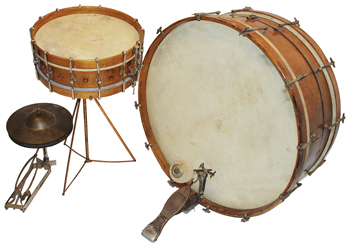 In addition to having a high-quality sound, the most important characteristics for drums during the early part of the 20th century was that they be lightweight and portable for easy cartage to performance venues by streetcar, horse and buggy, or even walking. 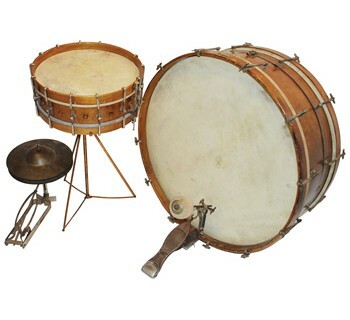 To address these concerns, Walberg and Auge developed and manufactured the “Carry All” Bass DrumThe lowest pitched drum in a marching band or with a drum set. 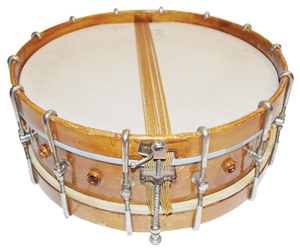 A two-headed drum, it is usually.... Patented July 27, 1909, it featured a split-shell design, which allowed the drummer to store the snare drumA hollow cylindrical shell of any size that has a head stretched over one or both ends and is b..., traps, sticks, and hardware inside. Two round boards were placed against the inside of the heads to protect them from the other instruments during transport. 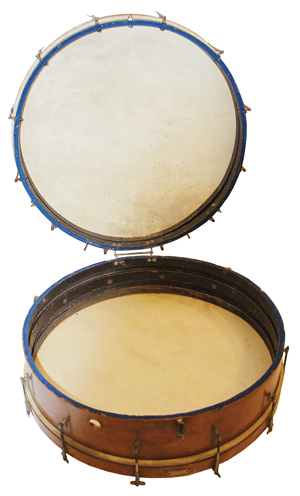 The bass drum, with all other instruments inside, was then placed in a single solid case with handles. The “De Lux Drum Outfit” was offered with several traps, such as a Chinese tom, ratchet, woodblocks, cowbells, and a cymbalA copper/bronze (or variation of metal alloy) disk struck with a drumstick or crashed together ..., none of which survive from this set. The main components, however, were the Perfection Booster snare drum, the Perfection Carry All bass drum, and the Ludwig bass drum pedalThe pedal used to play the bass drum on a drum set. . At some point, a Leedy Low Sock Cymbal Pedal, the forerunner of our modern hi-hatA piece of the drum set, consisting of two cymbals mounted on a stand. The cymbals are opened a..., was added to this set. This 26 x 10-inch Carry All bass drum features a maple, split-shell design with 12 thumbscrew tuning rods for each wooden hoopThe round metal or wooden disc that holds the drumhead onto the drum. Lug casings are then fast... and two calfskin heads. The 14 x 4-inch Booster snare drum features a maple shellThe cylindrical body of the drum, usually made from plywood. and hoops, 12-strand gut snares, and 12 “Independent Tuned Rods” that tension the batter and snare heads separately. The Ludwig Junior Pedal for the bass drum has patent dates of May 25, 1909 and April 7, 1914 stamped into the footboard. Mounted on the Low Sock Cymbal Pedal are two 10 1/2-inch brass cymbals.